A dark force has spread over the archipelagos. The radiation emanating from the tall obelisk looming defiantly on the horizon is polluting the once-serene isles. Only you can rid this strange land of the evil power that infects it. The object of this unusual and addictive game from Brittanica Software's FanFare line is to destroy the obelisk that you'll find on each of the game's 9999 levels. Before it can be eliminated, you'll have to find and destroy a series of radioactive nodes scattered around the islands. Destroying the nodes is easy—just place a crosshairs pointer on the same square as the node and collapse it with a click of the mouse button. Only after collapsing every node on a level will the obelisk become vulnerable. At that point, you'll have just 90 seconds to find and destroy it. As you examine each landscape in search of nodes, the mouse or cursor keys can be used to pan around your position. To move across the landscape, you place the crosshairs on any green land square and click on it. You'll zoom to the new location as the checkered ground scrolls smoothly beneath you. The animation is superb. Most of the island landscapes of Archipelagos are very large and irregularly shaped, making it nearly impossible to thoroughly search each area without consulting a map. By pressing a function key, your view is replaced with a map that includes a closeup of your immediate surroundings. Also helpful for getting your bearings is a mysterious red planet that sits in the northern sky. You must save the land from viral trees and other infections in Archipelagos. Although you can only travel onto green land squares, you can convert other squares to green land if you have enough energy. Your energy supply increases each time you destroy a node or collect a sand pod. You'll need to do this to get over large patches of infected land or to build land bridges to reach other islands. Many of Archipelagos' early levels are fairly easy and can be completed without ever creating new land or disinfecting any red squares. As you reach higher levels, the game becomes increasingly difficult. For instance, instead of finding all of the nodes on the same land mass as the obelisk, you'll have to search a number of individual islands for them and create new land squares over the ocean to reach them. Also, the number of viral trees infecting the land increases. If you get too close to a viral tree, it could infect the land you're on, killing you in the process. 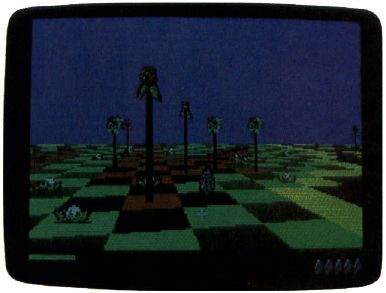 Beginning on level 13, you'll also have to worry about a necromancer that rises from the ground and moves around the landscape turning land squares to sand. Since each node must be connected to the obelisk by a contiguous land path before it can be destroyed, the necromancer can make creating and maintaining these paths a nightmare. Things really start getting tough on level 20, when eco-eggs begin hatching. One type of egg quickly infects the land with radioactive wastes, while another eats away at the land itself until there is nothing left. Finally, tornadolike air cleaners begin to appear on level 25. Contact with any of these will kill you, forcing you to start the level over again. Archipelagos has a lot going for it besides slick graphics animation and addictive gameplay. Each time you complete a level, you're told how long it took, and you're given the option to move on to the next level or repeat any of the previous levels. The highest level you've completed is automatically saved to disk, so, each time you play, you can pick up right where you left off. If you enjoy games that combine challenging logic puzzles with first-rate graphics animation, you'll definitely like Archipelagos.